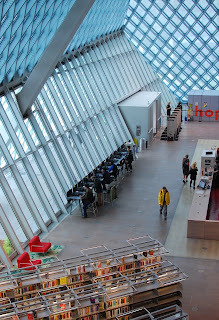 The Central branch of the Seattle Public Library presents two halves of a contradiction. From certain perspectives, it's a series of vast, underused, empty spaces. Other than the bottom, there is no public access to view any part of the atrium that spans eight stories. Level 4 is nothing but disorienting bright red curves. However, the real genius of the building is the arrangement of the main stacks. It's a continuous spiral, allowing the entire range of call numbers to flow from shelf to shelf across four stories or so. Unlike most libraries, there are no gaps or discontinuities. The only similar structures I can think of are certain parking garages, where every parking space is part of an ongoing ramp.